So yesterday was the kickoff for Occupy MN, the Twin Cities version of the big Occupy Wall Street protests. I wasn’t there all day, but was around for most of the afternoon and into the evening, and got to witness the rally (where I also performed), general assembly and milling-about time. Wasn't able to make it back today (I was speaking/performing at the Ramsey County Youth Conference), but I plan on being there throughout the upcoming week and beyond. Anyways, I hate to be an arm-chair organizer (I haven’t been around for planning meetings or whatever), but I’d rather share my thoughts than keep them to myself. 1. Spirits were high. All-day protests are tough because the crowd ebbs and flows. But there were a lot of people there, seemingly all day, and I didn’t get the sense that people were frustrated with all the milling about. People were having conversations, networking, hanging out—it was fun. 2. This movement is coming from a very ideologically pure place. I would argue that it doesn’t always work in practice, but at the very least, the intentions behind horizontal organizing and true democracy and wanting everyone to have a voice are very cool. Lots of people taking care of one another out there today. 3. I wouldn’t say that the crowd was super diverse, but it wasn’t as white as it could have been. Faint praise, maybe, but I think this is something that all of the organizers are really thinking about and taking seriously. Again, I’m not sure what they’re doing tactically to reach out to communities of color, working class people and other underrepresented groups, but the fact that the speakers’ list was genuinely diverse is a good start. And the speakers themselves did a great job. 4. 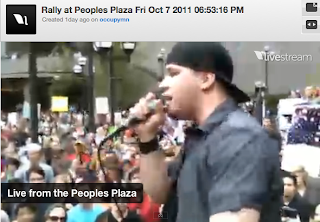 The most exciting thing about Occupy MN, for me, is the opportunity to engage in some good community education. We’re going to have workshops and teach-ins and discussions all week, and I think that will be great. 5. Media coverage has been quite good, at least from what I’ve seen. Even our local Fox News affiliate covered the protest in a very positive, almost encouraging, light. 1. Although the speakers were all good, I’m a pretty firm believer in the idea that at a rally, it is more important to put on an inspiring, dynamic program than it is to let everyone who deserves to speak get a chance on the mic. Maybe that makes me a horrible progressive, but I’m thinking about movement-building here. Have a meeting a week before the rally, figure out what people are most concerned about expressing, and consolidate those points into the speeches of three-to-five dynamite speakers instead of a dozen who may or may not be that engaging. Trim the fat, basically. At most rallies, most people say the same stuff anyway. Of course, the speakers’ list has to still be representative, but it’s something to think about. The audience has to come first, because that’s who you’re trying to inspire and motivate. 3. The general assembly was kind of a mess. Decision-making with enormous groups is always a challenge, and this WAS the very first one here, but still—I’d argue for breaking people into committees right away. We’d already been standing around for hours, let’s get down to some action. That way, we can also do away with the ridiculous call-and-response speeches—just have facilitators in every breakout group explain the process to groups of 20-40 people at a time. When you have 200 people ready to get involved, ready to ACT, you can’t let them get bored. You can’t let them get frustrated. Not right away. Energy like that needs to be focused, immediately, into an activity or discussion that is truly participatory and inspirational. 4. The endless nature of this protest makes me nervous. You can mobilize a thousand people for one day. But day after day after day? Into the winter? I’m just wondering what the strategy is here? I’d rather have, say, a week of events, or an every-Friday protest ongoing, or something other than an every day, all day occupation. It just seems like the kind of thing that, aside from being logistically complicated, will turn more people off, like “I respect their goals, but I ain’t sleeping outside.” And besides, it’s not really the kind of occupation that’s truly disrupting anything. It’s visible, though, so that’s a good thing—as long as the numbers stay up. 5. If you can’t tell, I’m a pragmatist. I think this protest could benefit from having a flyer—maybe one side is what the protest is all about, and the other side is five concrete action points that people can take. Maybe this is something that comes out of the general assembly, or maybe it's something that I should just go ahead and do, but those two questions—“why should I care” and “what can I do”—are incredibly important when it comes to creating new allies (as opposed to continually trying to mobilize the same few hundred folks who make up “the usual suspects”). But all of these are relatively minor points, and wide open to debate and disagreement. Did other people have similar thoughts? Am I off-target on any of these? Let’s talk about it. Overall, I’m excited about the prospect of a strong, multi-issue movement that can challenge the powers that be. I’m excited about taking part in community education sessions. I’m excited about this movement—or more specifically, the people who make up this movement—figuring out what we’re doing and moving forward with concrete actions. It’s an exciting time to give a damn about the world. Finally, I want people to check out this short essay from B.Dolan, one of my favorite hip hop artists and co-founder of KnowMore. It’s a suggestion for some concrete things that this movement can accomplish. Definitely worth a read. Hope everyone can get involved this week. Follow on Twitter at @occupymn or #occupymn. Big ups to everyone already there. Keep fighting. Good observations. I was there yesterday morning, and today until around one o'clock. Unfortunately I was the only one in my immediate peer group to make it, and I didn't know anyone down there. It was tough for me to *not* get bored (although I could've been better at "networking"). Today, though, I made an attempt to initiate things myself, mostly cleaning, and taping down stray signs. Regrettably, I must leave for a week, and hope there is something left when I get back. By then there will be some stronger leadership. As wonderful as a free-form grassroots movement can be, there needs to be a focus and leadership. Great article that you linked as well. Good insight. I read the article and the goals that were suggested, but it seems to me that it left out one of the most important, which is a JOBS bill to employ people. This is the most immediate issue we face and the one that affects us all, whether we have a job or not. I've noticed that the organizers are doing little-to-no outreach to even the professional level of queer activists (I may be wrong), and very few ever show up to our much smaller but more focused protests. (read CeCe Mcdonald) It would be really great if a straight (intelligent, talented,respected,handsome) activist wrote a piece about that case.